We are very pleased to welcome to today’s meeting, our special guest, the Reverend Malcolm Newman. We haven’t seen Malcolm for some time while he was caring for his wife, Jeanette, who sadly passed away in August. 28 members were present at our November meeting plus our speaker, Louise Camby. 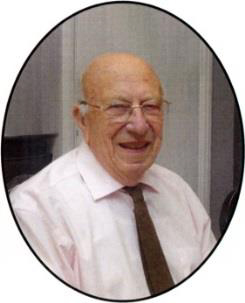 Since our meeting we have heard of the sad loss of our Companion Member, Bevan Taylor who died age 98, 8th November. Please see page 3.We’ve just heard that Arthur Trunchion’s wife, June, passed away last week. Almoner, Andrew Kellard, reported the absence of Derek Bass (sight failing), Brian Blakeney (car accident – now uses a walker), Gerry Thompson (on dialysis), Peter Mills (bowel cancer – op yesterday), Tony Simpson (hardly goes out), Norman Williams (prostate cancer), Arthur Trunchion (fall – head in bandages), Lionel Downton (various ailments). Reg Baker is here despite no longer driving following his crash. If you, your partner or another member is unwell please contact our almoner, Andrew Kellard on 01737 554055. Andrew also told us about his own prang – fortunately only monetary damage. Also temporarily for lunches – please notify Andrew by 10.30 am the prior Tuesday. The Charity Collection raised £56.53 and the raffle £27. Chairman, Ian Payne reminded members of various Committee Vacancies: Club Secretary (Dennis will be leaving the Committee at the AGM in March), Speakers Secretary, Outings Secretary, Luncheons Secretary. But also consider Vice Chairman, Treasurer, Membership, Website, Almoner and Newsletter. If any of these appeal, maybe we could arrange a swap. We need to fill these posts if the Club is to remain viable. All current Committee Members are willing to work with and support anyone taking on a new role. Ian Payne has expressed an interest in being Secretary and Andrew Banfield in Outings Secretary but only if there are other members willing to take on the Newsletter and Speaker Secretary roles. The next Committee Meeting brought forward to 3rd January. This gives members time to consider any nominations (self or other) between now and Christmas. I’ll remind you next month and by emailafter Christmas but by 3rd January, the Committee needs to have a full list of nominees ready for our AGM in March or else consider other ways forward. Louse was a voice-over artist for thirteen years. Her grandfather wrote the music for ‘The Railway Children’. Now she runs a business that markets Aloe Vera products. Aloe Vera is a succulent (not a cactus) of the lily family – the thick fleshy leaf is filled with nutrients – the bitter outer leaf is used for making Bitter Aloes. The plant has been known for 4000 years –Louise brought one round for us all to touch. Aloe Vera is a natural analgesic (pain remover) – the Japanese call it ‘no need for a doctor’. The gel contains 75 nutrients – many are anti-oxidants which remove free radicals. However, if exposed, the gel dies within fourhours. 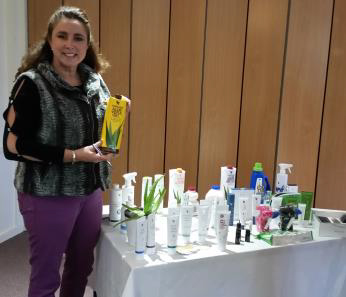 The trick is to stabilize it, which is what Louise’s company ‘Forever Living’ has achieved. They own 60% of the world production and run the business from growing to product (of which there are many – see picture). Louise then introduced us to many of the gels, creams, lotions and sprays, coming round and letting us sample them. With the right product it provides or cures: diet supplement, healthy lifestyle, dry skin, joint pains, eczema, arthritic pains, heat lotion, headache, shoulders, neck & joint pains, arthritis, sleep induction (rub on ones soles), deodorant, tooth gel, perfume,digestive problems. It’s the perfect cure, replacing all other medicines.Louise stayed to the end of our business meeting in order that she couldtake orders from suffering members. I couldn’t help thinking of 19thcentury patent medicines – but then, I’m generally a sceptic. December brings us to the end of our 50th Anniversary Year – and what a year. On 11th May we held our Celebration dinner – nearly 100 guests including the Mayor of Croydon and many other Probus Clubs. June saw the Anniversary Edition Newsletter – eight pages in colour. On 7th July, an anniversary special display at the Old Coulsdon Fair. Our Open Meeting on 2nd August marked our 600th meeting. The Free Celebration Lunch on 17th October was attended by 50 members and guests. Finally our Quiz on 2nd November. Wishing you and your families a very happy Christmas and prosperous New Year. Bevan was born in the champagne socialist area of Islington. His father ran a glass manufacturing company which was taken over by Pilkingtons. His mother soldiered on after his father’s death and was a benign matriarch to the family being cared for by Bevan’selder sister, Kay, who ending up living in Old Coulsdon, a few yards across Bradmore Green from her brother. Bevan excelled at school but was typically reserved about his achievements. He started a degree course in mathematics at London University, but was called up before he could complete his studies, serving abroad in the RAF as a meteorologist. Bevan married Joy in 1947. They went to the Queen’s Golden Wedding Garden Party with couples who had married in the same year. Bevan and Joy had two children, Kevin and Alison (died 2012) whose children, Alistair and Fiona, both supported Joy at Bevan’s funeral. The Taylor household was full with music and laughter. When not playingone of his legion of old 78’s, Bevan would have the family falling about with laughter over some typically corny pun or play on words. As they moved house, Joy sang in numerous choirs and Bevan played viola in the Worthing and Wimbledon Symphony Orchestras. He worked throughout his life for the Board of Inland Revenue but completed his disrupted studies at the Open University, whilst working and supporting a family. Family holidays were meticulously planned often to geographical features such as (after trudging through open fields) ‘the Niagara of Wales’, only forhoots of derision as they arrived at a small dribble. After the children had left home, Bevan and Joy caught the international cruising bug. They moved to Old Coulsdon over 20 years ago. Bevan joined Coulsdon Probus in 1998, always looking forward each month to chatting with like minds. Bevan became a companion member in 2011 but was always pleased to be kept in touch via the Newsletter. The Quiz took place on 2nd November at the Cameron Hall, Old Coulsdon. Dennis Evans was the quizmaster; we had a fish and chip supper, and visiting Probus Clubs from Sanderstead & Riddlesdown (winners) and Warlingham & District Probus clubs. A good time was had by all. How would you have done? Here are a few of the questions. If you see a guardsman on duty at Buckingham Palace with the buttons on his tunic in PAIRS, what specific guards regiment does he belong to? Gravestone epitaphs: a) In the village of Sutton Courtenay, (Oxon) – Eric Arthur Blair, 1903-1950. Under what pen name did he write his famous books? b) In Winchelsea (East Sussex) – named the nations favourite epitaph, ‘Duirt Me Leat Go Raibh MeBreoite’ in Gaelic, meaning ‘I told you I was ill’. Who was the famous comedian? A food producer with a reputation for its pickled herrings agreed to share its name with which famous pop Group? 4. You are to carry out a CPR (Cardiopulmonary Resuscitation). Humming what hit by Spanish Duo, Los Del Rio, is said to improve your chances of saving the person’s life? Bob Wilson (Robert Primrose Wilson OBE) the Arsenal goalkeeper and four US Presidents: John Fitzgerald Kennedy, Franklin Delano Roosevelt, Richard Milhous Nixon, Lyndon Baines Johnson, all have unusual middle names. Where did they come from? The body of a) Nelson was returned from Trafalgar (1805) preserved in a cask of what? b) Alexander the Great was returned from Babylon to Macedonia (323 BC) preserved in a container of what? What city will host the XXXIV summer Olympic Games in 2028? How many a) White playing squares are on a chessboard? b) Playing squares are on a Scrabble Board? c) Dots are there on a standard set of dominos? The ownership of Mute Swans (Cygnus Olor) on the Thames is shared equally among the Crown, and two City of London livery companies, can you name both? Two famous Englishmen, both buried at a St Peter’s: a) What naturalist died at his home in Downe, Kent and is buried in the Collegiate Church of St Peter in London? b) What composer died in France, and is buried in St Peter’s Church, Limpsfield, Surrey? How many legs has a woodlouse? a) The Silk Worm is an insect, but it is not a worm. b) The Slow Worm is a reptile, but it is not a worm. What are they? What is the largest country by size in Africa? a) On which Greek Island was an armless statue of Aphrodite found, subsequently seen as an ideal of female beauty? b) What is the best known feature of Bedloe’s Island? According to Genesis in the Bible: a) From what wood was Noah’s Arkconstructed? b) In Jewish tradition which fruit did Eve give Adam? What follows, Vienna, Brussels, Prague, Copenhagen, Tallinn, Helsinki, Athens?